As entrepreneurs, we talk a lot about new revenue streams and how to exponentially increase your revenue. 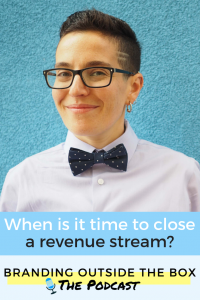 But have you ever considered that you may need to close one of those revenue streams? 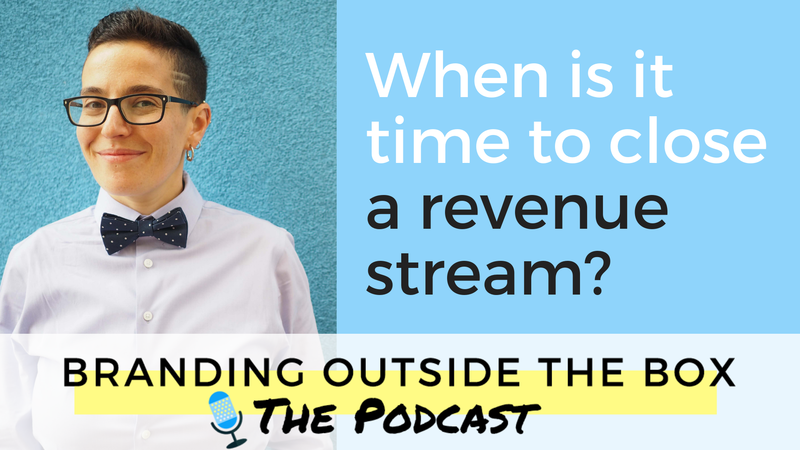 In today’s episode, I’m sharing why I decided to eliminate one of my revenue streams, even though it’s been earning thousands of dollars each year, and the ways you can determine for yourself if a revenue stream really isn’t working. Create a list of all the products and services you offer. This includes affiliate revenue, e-courses, digital downloads, membership sides, consultations, full-service offerings, physical products, group programs…whatever you sell, write it down. I recommend doing this in a spreadsheet because we’re about to do some math in a minute! Input net income for each product. This is income minus fees and expenses. Input how much time you spent marketing and maintaining each product, not including the time it took to create the actual product. Divide your revenue by the number of hours you spent. That is your hourly rate for that project. You may be surprised by the results, but this will give you clarity on which revenue streams to scale and which to stop. In this episode, I also mentioned that I’ll be closing the Your Book, Your Brand e-course at the end of 2018. If you’re an author and want to enroll in the e-course while there’s still time, click here and receive $150 off your registration.